Why is the Bill of Rights so important to Americans? The first ten amendments to the US Constitution were adopted in 1791. These are the basic rights that all Americans have. Its purpose is to protect the people from the government. 2. The right of the people to bear arms shall not be infringed. 3. The quartering of soldiers in private homes in peace time without the owner's consent is prohibited. 4. Prohibits the unreasonable search and seizure of persons and property and forbids the use of general warrants for search or arrest. 5. A person accused of a crime may not be tried twice for the same offense and he may not be compelled to be a witness against himself (self incriminating evidence). 6. Gives an accused person in a criminal case the right to a speedy trial, an impartial jury, knowledge of the charges against him and to defense counsel. The accused has the right to confront hostile witnesses and to obtain friendly witnesses. 7. Guarantees a jury trial in most civil cases. 8. Prohibits excessive fines and bails and cruel punishments. 9. The rights of the people are not limited to the rights listed in the first 8 amendments. 10. 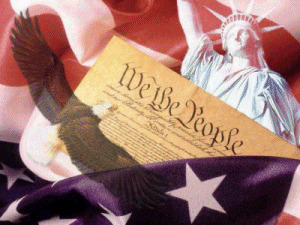 Reserves to the states or to the people all powers not prohibited to the states or given to the federal government.